Snow Ajisai Mountain (アナベルの雪山) is one of the most beautiful Hydrangea Spot in Tokyo. White Ajisai bloom at the hill of the mountain to create the white snow mountain. It is located in Ajisai Garden of Tokyo Summer Land. Hidrangea bloom from the middle of June to the beginning of July. There are 60 kinds 15,000 Ajisai trees in this garden. Admission: 600 yen for adult and 300 yen for kids. There is a group discount. 1. use local bus to Tokyo Summer Land. Ajisai Garden of Tokyo Summer Land is one of the popular Hydrangea Spot in Tokyo. 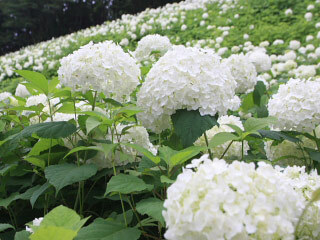 Especially, the hill of white Hydrangea is very famous. There are 60 kinds 15,000 Ajisai trees in this garden. At the weekend, there are many events in this garden.